In 2012, I wrote an article on the campaign by American Medical Association (AMA), to reduce the number of cigarette smoking and tobacco products highlighted in movies. It’s an important article and I recently reposted in this past March 6, 2018. Hollywood is heterogeneous with varying perspectives on rates of tobacco use portrayal; intentionality of the decision to use and the necessity to portray tobacco use; and its degree of acceptance of responsibility for influencing societal smoking. Tobacco depiction may originate with the writer, actor, or director and is included most frequently to elucidate character or portray reality. On-camera smoking is influenced by actors’ off-camera tobacco use. The reality appears to be that young people today start smoking because of how often they see it depicted by stars of the screen who glorify it. It makes them appear older, more mature, in control, etc. Impressionable young people who seek this stature in society often gravitate toward those things. Most would agree that movies, TV programs, music videos, and even video games often contain messages, whether overt or hidden. These genres have the capability of creating trends in society. We see our favorite celebs or stars and many want to emulate them. People want to wear what they are wearing. They want to talk as those people talk. They want to eat the same foods, go to the same places and essentially, be that type of person if that person is seen as “cool,” “together,” etc. In essence, all of these things – movies, TV shows, music videos, video games – are all advertisements for many things. Whether the main character in a violent video game walks or drives through a town running people over, beating them, or shooting them, or it’s seen and glorified in a music video or movie, the truth is that these things have a great deal of say in what motivates people and what is created in society. When I was growing up, I would routinely watch cowboy movies. Gun shootouts always occurred along with fist fights between obviously good and obviously bad guys. You never had to wonder or ask who was the good or bad guy. In western cowboy movies, the good guy often wore white hats while the bad guys wore black ones. Today, these lines have been purposefully blurred. Often, good guys or bad guys are difficult to see at the onset. Often, the real bad guys are not revealed until the final few moments of a mystery, thriller, or sci-fi movie. But the shootouts I watched in my youth were bloodless. A bad guy was shot, he fell over and died and there was no blood anywhere. It was the implication that told the story. Decades later, we watch as people are systematically dismembered, blood spattering everywhere. People are not just shot. They are shot until they look like swiss cheese, with blood spurting in all directions. Limbs are chopped off, women are raped violently, with detail after detail shown on the silver screen. A few years ago, I marveled at the fact that numerous celebrities who spoke before Congress concerning gun control. More than one of them said things like, We know that there is no connection between violence in movies and an increased violence in society. There are no studies that show any connection, or things to that effect. The truth is that this statement is 100% wrong. 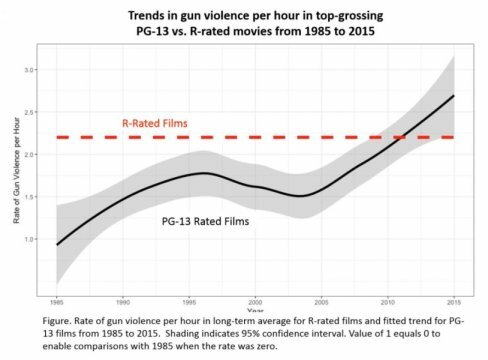 If it has been proven that a higher incidence and glorification of smoking in movies, TV and video games results in an increase in young people starting to smoke (at least half of that increase is in young people), then how can anyone with a straight face say that these same movies, TV shows, video games and music videos have zero effect on gun violence or violence in general throughout society? I don’t need “statistics” to tell me that society has gotten far more violent today than it was in my day as a youngster. I don’t need studies and reports to show me a connection between the growing violent trends in many genres from Hollywood and society. All I need to see is that there has been proof that at least half of the reason young people started smoking is because of the incidents and glorification of smoking and tobacco products in movies, TV shows, video games and music videos. That’s all it takes to prove that these things can have a drastic effect on society. With respect to all of the gun violence that is constantly seen in movies, TV shows and the like, how can people wonder why there is an uptick in gun violence in society? These movies, etc., have served to desensitize society to the gory violence. We see movie after movie of people being hacked up, shot up, bludgeoned to death, dismembered, violently raped or violated, and we actually have to wonder why there is more of this in society and why the young people of today seem so insensitive about death and violence? Folks, this is not a mystery. Young people growing up today watch hours and hours of many forms of violence, whether in movies, TV shows, or video games. In video games, they actually vicariously participate in it often. It’s one thing to play a reality type historical war game and quite another to portray a person driving a car through a large city running over as many people as possible and in general, doing as much damage as they possibly can. The message is clear that breaking the law, creating carnage is good and a person can get away with it without the repercussions that occur in real society. My wife and I marvel because there is so very little on television anymore that is worth watching. We recently canceled our NETFLIX subscription because the company itself has almost completely become a Leftist tool to brainwash society. They have produced some of the most asinine shows like Dear White People, which is a continual dressing down of white people for our alleged white “privilege.” The only people watching that one are those on the Left who already agree with the message. If they’re Leftist white people, they will simply feel even worse about the fact that they are white. If they are Leftist black people, they will have more reasons to hate whites. How is a show like this beneficial to society if this is what it accomplishes? I have no seen any real, genuine dialog occur that has helped people from different races come together. NETFLIX is also in talks with the Obamas to create programming. This will be nothing more than continued Marxist indoctrination. People will watch because they already agree with Obama’s Marxist ideology. The programming will simply be advertisements for Marxism. Why should I continue to support a programming channel that does that? I can vote with my money and have done so. People who do not believe that Hollywood’s movies, TV shows, video games and music videos does not alter society are not paying attention. Rather, they believe that these things are a reflection of what already exists in society. No, not at all. The movies, TV shows, video games, and music videos are all advertisements for a product and it is not long after the debut of these “ads” that society begins to mimic what has been portrayed. It happens all the time. Think about Back to the Future. In many ways, a wonderful trilogy of movies that were based on the serials of yesteryear. It was clear who the bad guys were as well as the good guys. The goal was to change society back to what it had been before Doc Brown created the “infernal” time machine. It was just fun watching the movies. But it also wasn’t long before every kid who was into skateboarding wanted a hover board too. Director Bob Zemekis had made an offhand comment about these boards being in someone’s garage, so they incorporated it into the movie. He was just joking as it turned out since hover boards did not exist then and only a few prototypes have actually been created since. These are not things that can be purchased, yet many kids wanted them. In other cases, a company can actually pay to have their product or service incorporated inside a movie or TV show. You’ve seen it time and time again. A character in the movie will grab a soda that actually has the real name of a soda that exists in real life. They don’t do this because they like that soda. They do it because the soda company has paid at least $10,000 for a single placement, which gives the viewer just enough time to realize what the soda is, but not enough time to be distracted from the movie itself. Interestingly enough, you may want to run to the concession stand and buy that same soda to watch the movie with after that. Gun violence in real life exists because gun violence in movies, TV shows, video games, and music videos exists. It doesn’t take a rocket scientist to figure that out. But what is the reaction to this violence? Instead of insisting that Hollywood retraces their steps to a gentler time, those who hate guns want more gun control laws. Though they won’t admit it, they actually want guns to be banned. I’ve noticed a few on social networks actually stating that: ban handguns or ban AR-15s, etc. This is their thinking. They believe that banning guns will curb gun violence. The problem of course is that guns already exist in society. There are too many guns that are available on the streets, many of them brought in through Mexico from Mexico or Latin America. Did Prohibition work? Nope. Has the “war on drugs” eliminated drug use? Nope. During Prohibition, people simply went underground with speakeasies to continue drinking. The war on drugs has done nothing to curb drug use. The drug problem continues unabated today. Shows like Breaking Bad don’t help the situation. In some ways, they actually encourage people to produce their own drugs because of the wealth that can be gained from it. There is so much duplicity out there. So much is kept hidden from people that many do not even realize how society has been and continues to be affected by the virtual garbage produced by Hollywood. Many politicians are just as duplicitous and bought by donors with deep pockets from Hollywood and elsewhere. On the surface, they spout their hatred of guns and gun-related violence. Underneath, they are wolves in sheep’s clothing, out only for their own self-aggrandizement. Senator Leland Yee (D-CA), is just one example. He was a champion of gun control. He was virulently opposed to guns and wanted to do all he could to curb gun violence. Yet, we’ve learned that he just began a five-year sentence in prison for gun trafficking. What? He was buying fully automatic guns from an overseas terrorist group and trying to resell them so that they would be distributed throughout the United States. Unfortunately for him, he was trying to sell them to an undercover FBI agent. Yee was also charged with accepting thousands of dollars in bribes. Apparently, Yee was going to be termed out of the California Senate, so he had his sights set on other government positions in the state. He needed money to make that happen. I’m sure, having illegal weaponry distributed into society would have also aided him in calling for greater gun control measures once people started dying with these automatic weapons that he had brought in. This is a duly elected senator of the United States Congress effectively working to over throw the rule of law in America. It is reminiscent of Obama’s “Fast and Furious,” which would have accomplished the same thing. Unfortunately, a number of border agents were killed with weapons illegally purchased through this Fast and Furious scheme. Actor Matt Damon is seriously thinking about moving to Australia because of his loathing for President Trump and his hatred of gun violence. Yet, he performs in the Bourne movies as a killer elite, an assassin who fights, shoots, and kills his way through one movie after another. The level of violence exhibited is unbelievable, but Damon would likely say “it’s only a movie.” In reality, these movies are a big part of the problem. Gone are the days when things were implied. It’s all shown in all its goriness. Nothing is held back. The more brutally violent and blood spattering, the better, all for ratings. It has changed society terribly. 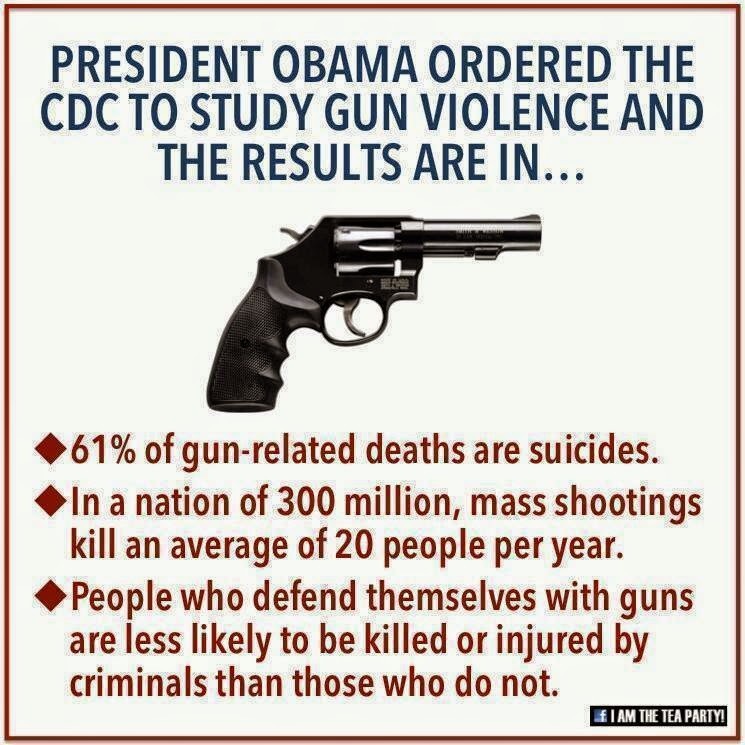 No amount of new gun laws will keep criminals and mentally ill from obtaining guns. 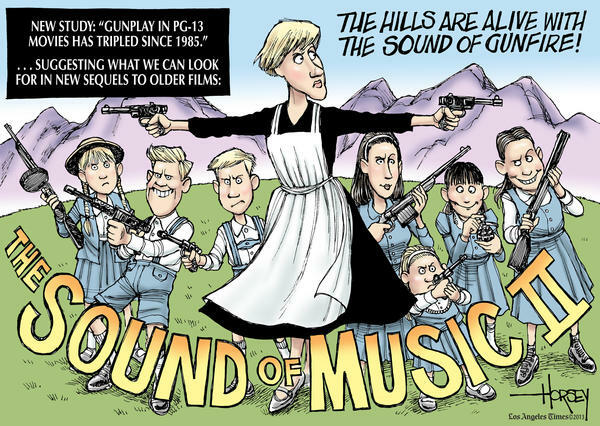 Even if there was a complete ban on guns from the government, guns exist and would be available to criminals/mentally ill.
What has gotten us to this point is Hollywood’s constant depiction of ultra-violence in movies, TV shows, video games, and music videos. I believe it is too late to put the genie back into the bottle. It’s already harmed society by indoctrinating young people to feel no empathy for victims or to even be appalled at the level of violence that exists. The attitudes of people have changed greatly since my days as a young person. There is so much violence depicted and realistically so, people have become completely desensitized to it and actually laugh at it. No “law” can fix that. Only God can fix it and in order to do that, people have to want that to happen, individually. There’s little sign that they do and there is no sign that Hollywood wants to either. Entry filed under: 9/11, Agenda 21, Atheism and religion, Cultural Marxism, Demonic, devil worship, Emotional virtue, eternity, Global Elite, Political Correctness, Politically Correct, Politics, Religious - Christian - End Times, Religious - Christian - Prophecy, Religious - Christian - Theology, salvation, Satanism. Tags: gun violence, hollywood violence.